Source – address of file to download. Sorting filter – name of the filter to apply to the task. Learn more. Destination – path where to save downloaded data. Maximum thread count – count of simultaneous connections to be used during download. Label (tag on OS X 10.8 or newer) to apply to downloaded file. Open downloaded file – check this box if you want the application to open downloaded file (not available in version downloaded from the Mac App Store). Action to perform when you click the Save button. In case the resource requires authentication uncheck the anonymous login box to fill values into fields username and password. To save provided credentials make sure the appropriate box is checked. Mirror is an alternative source address which can be utilized during download. Progressive Downloader will find the fastest way to download file when mirrors are provided so always add mirrors if there are some. Don’t have any mirrors? No problem! By default, the application automatically looks for available mirrors on download start but this behavior can be changed from Preferences -> Connection -> Mirror Search. Integrity of downloaded file can be checked on download finish if you provide a hash value and select the function used to calculate the value. In order to delay download start you can schedule it by specifying time and date. Insure Progressive Downloader will be running at the moment of planned start. 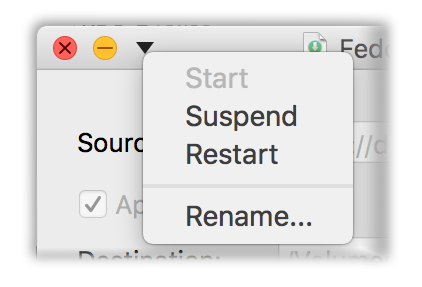 No need to switch to the main window to suspend or resume a task. The title menu gives control over task state and result file name. When source address points at a ZIP archive the preview check-box becomes enabled. Check the box and click Preview to open the zip file content.